Around noon, the Dow Jones Industrial Average rose 87.62 points, or 0.48 percent, to 18,182.45. U.S. stocks reversed early losses to trade higher around midday Tuesday following the first presidential debate between Hillary Clinton and Donald Trump. [dropcap color=”#008040″ boxed=”yes” boxed_radius=”8px” class=”” id=””]A[/dropcap]round noon, the Dow Jones Industrial Average rose 87.62 points, or 0.48 percent, to 18,182.45. The S&P 500 gained 8.58 points, or 0.40 percent, to 2,154.68. The Nasdaq Composite Index was up 30.73 points, or 0.58 percent, to 5,288.23. 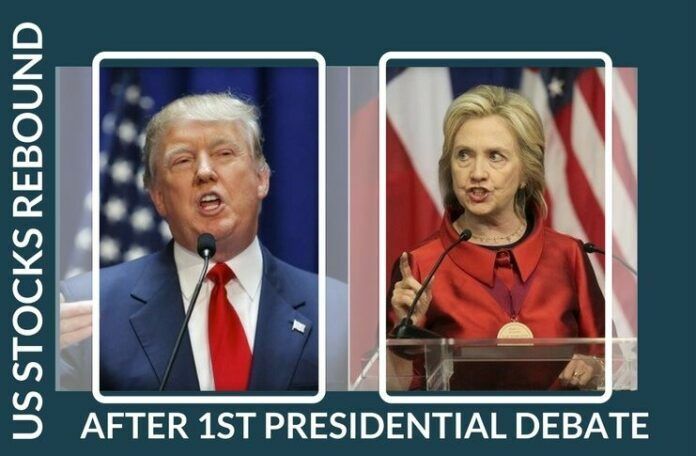 Democrat Hillary Clinton and Republican Donald Trump faced off for the first time in the chaotic 2016 election cycle Monday evening, with Clinton calling out Trump for not releasing tax returns and telling lies, while Trump labeled Clinton a traditional politician. The debate marked the first of three presidential debates and one vice-presidential debate that will take place before the Nov. 8 election day. The performance of each candidate at the debates could be crucial to clinching the presidency, as various polls have showed a tightened race in many of the swing states in recent weeks. [dropcap color=”#008040″ boxed=”yes” boxed_radius=”8px” class=”” id=””]O[/dropcap]n the economic front, the S&P CoreLogic Case-Shiller 20-City Composite index rose 5.0 percent year over year, slightly below market consensus of 5.1 percent. The Conference Board Consumer Confidence Index came in at 104.1 in September, up from 101.8 in August and beating market estimates of 98.8. On Monday, U.S. stocks retreated further as investor sentiment was dented by a broadly-based stock decline around the world.